The link for the show, if you have trouble listening, is here. Echoing some of the arguments discussed here in the blog (for a list of posts on free trade go here, and for the effect of free trade on the Trump election here, here and here) Robert Wade suggests that the economics profession defense of "Free Trade" might have something to do with the election of Trump. The Master of Arts degree in Economics at John Jay College is a new graduate program providing both practical skills for work in economic policy, and a foundation for study at the PhD level. Located in the heart of Manhattan, it is one of a handful of graduate economics programs in the country that makes alternative perspectives a core part of the curriculum. Students at John Jay will study the history of economic thought, Marxian and Post Keynesian theory, economic history, the economics of gender, environmental sustainability, and global inequalities of income and wealth; as well as learning the core technical skills they need for a profession or further academic work in economics. This is a 36-credit, two year program. Tuition and fees are approximately $4,000 per semester for New York State residents, and $7,250 per semester for out-of-state students. Video of the talk at Keene State College on March 20th, 2017. Short documentary on the limits of capitalism mostly based on an interview by Richard Wolf. I find the simplistic explanation of exploitation at the end (around minute 27:30) based on the time of work (prices proportional to labor incorporated) to be problematic (for a discussion of the Labor Theory of Value, LTV go here). At any rate, worth watching whether you agree with Wolf's interpretation of Marx and capitalism or not. Latin America’s Crisis: The End of the Commodity Super-Cycle, or the Return of Neoliberalism? From this announcement about my talk at Keene State College today at 7pm. "Professor Vernengo will offer a public lecture and discussion of the recent slowdown in economic growth. The talk will consider the degree to which these events reflect the fall in primary commodity prices, particularly oil, or are instead the result of a return to neoliberal policy prescriptions. Dr. Vernengo is currently Full Professor of Economics at Bucknell University. He is the former Senior Manager of Economic Research at the Central Bank of Argentina, and has acted as an external consultant for the International Labor Office (ILO), United Nations Development Program (UNDP), the Economic Commission for Latin America and the Caribbean (ECLAC), and the United Nations Conference on Trade and Development (UNCTAD)." The positive relationship between nominal interest rates and inflation is not a new stylized fact in economic theory. In the 19th Century Thomas Tooke (1774-1858) considered it a general rule illustrated by the data presented in his History of Prices and the State of Circulation, 1792-1856 (published over the period 1838-1857). Tooke´s views were challenged by Knut Wicksell (1851-1926): “Tooke´s thesis is certainly wrong…The argument is based on the inadmissible, not to say impossible, assumption that wages and rent would at the same time remain constant, whereas in reality a lowering of the rate of interest is equivalent to a raising of the shares of the other factors of production in the product” (Wicksell, Lectures on Political Economy, II, p. 183). Wicksell´s criticism of Tooke and his disciples led him to explain the rise in prices and inflation by the gap between the natural rate of interest (“the rate of interest at which the demand for loan capital and the supply of savings exactly agree”, Ibid, p. 193 and which depends on real as opposed to monetary factors including “the efficiency of production…the available amount of fixed and liquid capital, on the supply of labour and land…” Wicksell, Interest and Prices (1936 (1898) p. 106)) and the money rate of interest. Assuming full employment, a pure credit system and that banks respond endogenously to the demand for credit Wicksell showed that when the natural rate of interest exceeded the money rate of interest an inflationary process ensued. The inflationary process led eventually to an increase in the money rate of interest to match the natural rate of interest at which point inflation would stop. In this way Wicksell was able to resurrect the positive relation between the money rate of interest and inflation while rejecting Tooke´s theses. The Wicksellian distinction between the natural and money rate of interest is at the heart of the New Keynesian model. It appears in the aggregate demand equation (IS) and in the Taylor rule and in fact the Central Banks that have explicit inflation targeting regimes (as well as some that do not) must obtain estimates of the natural rate for their models to be operative. Without the natural rate there would be no New Keynesian monetary models. However, it is odd, that the relation they postulate between the money rate of interest and inflation is exactly opposite to that of Wicksell. Needless to say, New Keynesian inflation targeting models do not have scope or space to include the type of causality between interest rate and asset markets envisage by Tooke (which is an essential component of Keynesian economics). These models do not include the banking system or asset markets. This is due to their firm commitment to the upgraded “divine coincidence”: price stability (equating the market and natural rate) is equivalent to full employment and to financial market stability. 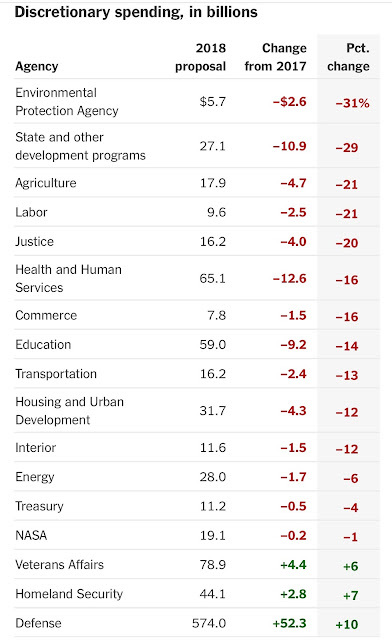 The figure from the New York Times shows the changes in spending by category. More defense and less social spending. Not a surprise there. Schumpeter long ago (in his The Crisis of the Tax State) suggested that it is the fiscal history of a society that explains the spirit of the people and the character of the government, since it is there plain to see by those that can read it what they are trying to achieve. 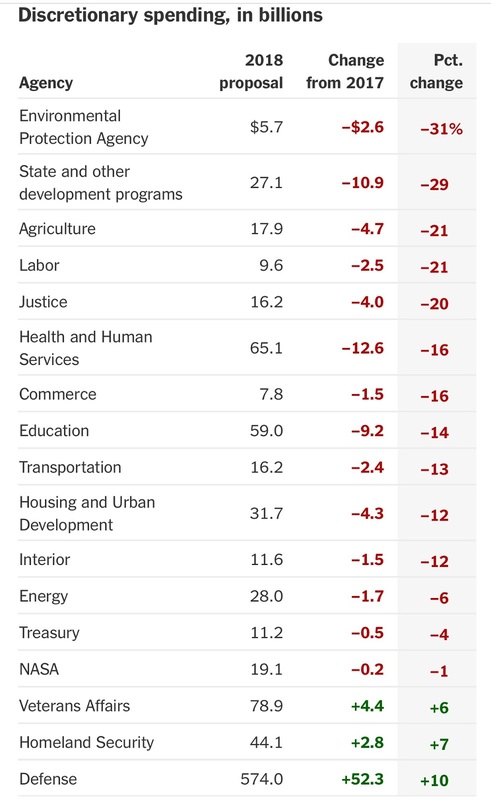 The surprise to me, at least so far, is that the increase in defense seems to be more or less cancelled by the cuts in social spending. I suppose the stimulus part of his fiscal plan will come just from the tax cuts. If that is the case, I would not be too optimistic about the Trump boom. Since the 2000s, like other countries in the region, Brazil adopted inflation targeting. The results are not encouraging. Brazil has, without doubt, the highest interest rate levels of Latin American economies. Brazil also has probably the widest interest rate spread in the region. In the first months of 2017, the monetary policy rate stood at 12.25%. Available data for interest rates for the year 2016 show that the deposit rate is around 12.43%, while the lending rate nears, 50 %. In addition, between 2013 and 2016 the Central Bank steadily raised its monetary policy rate bringing it to the highest level in seven years. The stylized fact that is even more disturbing is that at least since the beginning 2010, the monetary policy rate is positively related to the rate of inflation (Figure 1). This stylized fact contradicts the very basis on which Brazil´s inflation target regime is founded and has sparked an important debate in monetary policy involving well known Brazilian economists including, among others, Lara Resende Eduardo Loyo, and Luiz Carlos Bresser-Pereira. At the conceptual level the debate centers around New Keynesianism and Neo-Fihserianism. The inflation targeting framework is founded upon New Keynesian principles (rational expectations plus market rigidities) rests on three simple equations (in its reduced and essential form), aggregate demand and supply equations (IS and Phillips curve) and a Taylor rule. These are shown below. (1) Yg=f(rn-rt, et), where Yg is the output gap and rn and rt are the natural and current interest rates. (2) πt=f(Et(πt+i),Yg, vt), πt=inflation rate; Et=mathematical expectation formed in t.
(3) it=f(Et(πt+i), θπ πg, θY Yg, ut), where it=policy rate of interest, θπ,θY=policy parameters associated with the inflation and output gaps, and et, vt, ut are random errors, independently distributed with mean zero and constant variance. The aggregate demand equation (1) specifies a negative relation between the real interest rate (or to be more precise the gap between the real and natural rate of interest) and the output gap (the difference between the actual level of output and the potential, i.e., natural, level of output). The aggregate supply equation (2) specifies a positive relation between inflation (or the difference between actual inflation and the target inflation rates) and the output gap. Finally, the Taylor Rule (3) introduces the policy reaction of the Central Bank by postulating a positive relationship the nominal policy rate of the Central and the inflation and output gaps. The logic of the model is simple: an increase in the output gap brings about a rise in the rate of inflation (aggregate supply equation, (2)) which triggers an increase in the policy rate (Taylor rule, (3)) by the authorities and this reduces the output gap (aggregate demand, (1)). In turn, the reduction in the output gap narrows the inflation gap. Thus the model is stable. However, stability (and uniqueness) require two conditions. First, it requires adding to the above three equation model, the Fisher equation ((4) rt=it-Et(πt+i)). Second it requires that the parameter on the inflation gap in the monetary policy reaction function (3) be greater than one (θπ>1). That is, when the inflation rate increases and is off target, the increase in policy rates should be greater than the rise in the inflation rate. Only in this way can the nominal interest increase bring about a reduction in the output gap (aggregate demand equation). If θπ<1 a nominal increase in the rate of interest would not do the trick: aggregate demand responds only to variations in the real and not in the nominal rate of interest. Thus, within the logic of New Keynesianism the reason why the nominal policy rate and the inflation rate move positively together is due to the simple fact that Brazil has a “dovish” Central Bank (θπ<1). 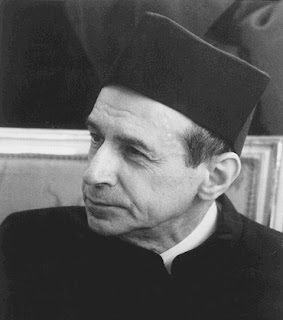 A documentary about Kalecki can be seen here (no way to embed, sorry). H/t to Franklin Serrano. The authors suggest that "the relative shares of the different fields are fairly constant over time: theory is the largest field, accounting for about 30 percent of all articles; macro is next (about 20 percent of papers); labor and microeconomics are tied for third (16–17 percent each); and econometrics, IO, and international each account for about 10–12 percent of papers)." However, you can notice (or so it seems visually) that the Lab Experiment field now appears clearly, and that Development, Health, Finance and IO have grown over time. I would prefer to have the graph with the shares of fields. 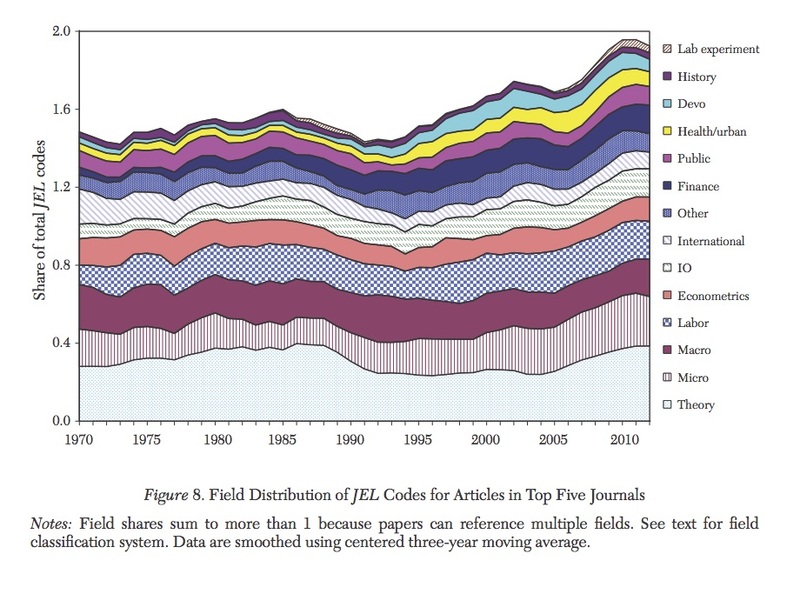 Perhaps more interestingly the authors note that "papers in Development and International Economics published since 1990 are more highly cited than older (pre-1990) papers in these fields, whereas recent papers in Econometrics and Theory are less cited than older papers in these fields." More experiments, less citation of theory and more citations of development and and international. That's what mainstream economists have been doing. It would be interesting to see what the heterodox ones have been up to in the same period. * The top five mainstream journals according to the authors are the American Economic Review, Econometrica, the Journal of Political Economy, the Quarterly Journal of Economics, and the Review of Economic Studies. 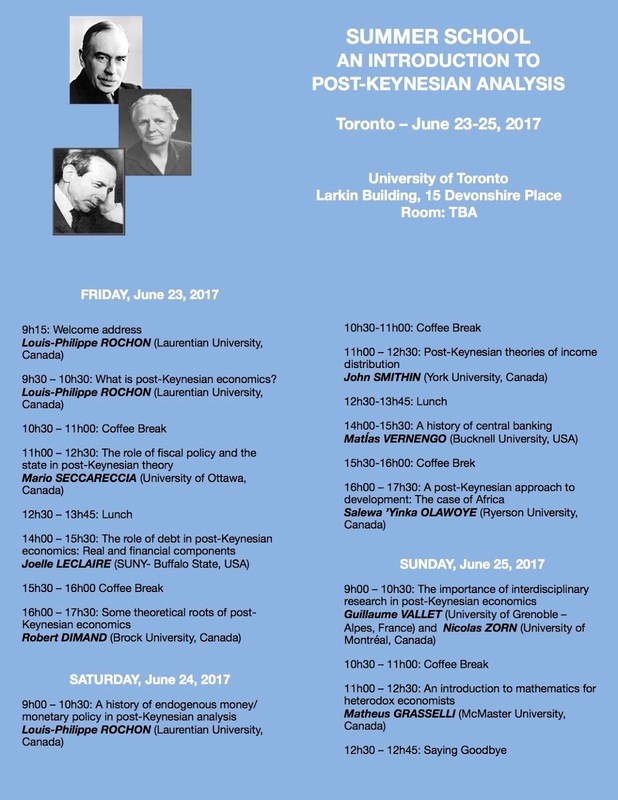 The Summer School is at the same time than the Annual Meetings of the History of Economics Society, and it is sponsored by ROKE. This paper argues that QE led to significant changes in the global financial system, which, are not conducive to greater financial stability. Through a policy of reserve accumulation, QE disconnected base money from the money supply and deposits from loans. Jointly with the deleveraging process of global banks, QE contributed to restrain the supply of bank credit growth throughout the world. Also global banks continued to expand their trading on the basis of opaque instruments such as derivatives. Moreover, by altering the relative profitability of investing in different assets, QE exerted a positive effect on the performance of the international bond market. This not only spilled into emerging market economies expanding the debt of both the financial sector and the non-financial corporate sector but also has reinforced the role of the asset management industry in financial markets. Due to its concentration and interconnectedness, illiquidity, and pro-cyclicality the asset management industry poses important risks to financial stability. Money is at the center of macroeconomics, which makes understanding the money supply central for macroeconomic theory. this paper presents the Post Keynesian theory of endogenous money supply and shows how it is fundamentally different from the conventional money supply theory. the conventional approach relies on the money multiplier and bank lending is invisible. Post Keynesian theory discards the money multiplier and focuses on bank lending which drives money creation. the paper emphasizes the structuralist version of Post Keynesian theory which retains Keynes’ liquidity preference theory of long term interest rates and also recognizes banks are subject to nancial constraints that limit their lending activities. the paper then shows how to derive the Lm schedule in an endogenous money economy, which is a necessary prelude to reconstructing the IsLm model.